There's something very evocative about driving at night ... especially out here, where the roads are nearly empty and the distances are long and the skies go on forever. 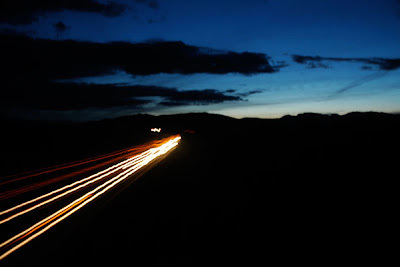 I took this shot a couple of years ago, about halfway between Bozeman and Butte, just a little after sunset. Even though I was on an interstate, I had to wait and wait for some cars to pass by so I could take my photo.